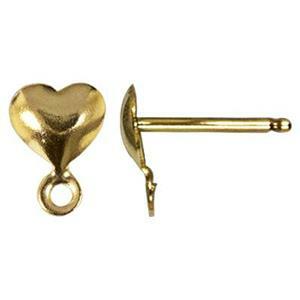 14/20 GF 5.1x7.2mm Heart Post Earring, .7mm Post Thickness, 1mm Closed Ring ID. Clutches not Included. 10pc pack is the equivalent of 5 pairs. A Happy Heart makes the Face Cheerful! Proverbs 15:13. Bring some Cheer with our Happy Little GF1897R – 14/20 Yellow Gold-Filled Heart Post Earrings. These have a 1mm Inside Diameter Closed Ring which will accommodate a 19 Gauge or Thinner Jump Ring to Hang some Chain, Crystals, Pearls or Gemstones from. Please choose from our Gold-Filled Clutches to affix to your Posts. A great way to give your Face a Lift!